Point No Point Lighthouse – Chesapeake Chapter U.S.L.H.S. The first requests for placing a light at this location were sent to Congress in 1891. Congress took no action and the requests were made each year until finally in 1901 $65,000 was granted for the building of the light. Contracts were let for the fabrication of the caisson and the iron work in 1902. Construction on site also began in 1902 with the erection of a work pier and the building of a temporary caisson to ready the bottom in the 22 feet of water to accept the iron caisson. On April 3 there was an accident in which the wood pier collapsed and the three sectioned iron caisson floated down the Bay in gale force winds. The caisson was finally recovered 40 miles south off the Rappahannock River. It was repaired and placed in its correct position on October 22 of 1903. Work again continued and was going well when in February of 1904, heavy ice again destroyed the pier and most of the construction equipment. The caisson was not damaged this time. After rebuilding the pier and reordering the equipment and parts that were lost, work continued and completed. The light was first shown on April 24, 1905. It consisted of a fourth-order fresnel lens with a light burning kerosene. It had a flashing white and red light that alternated every 20 seconds. There was also a fog bell that was struck twice every 15 seconds. The light is 52 feet above the water. The lighthouse is octagon shaped with 11 foot sides. The first two stories are brick with the third floor, the watch room, of wood frame construction. There are four dormer windows on the watch level. The roof is painted black, the brick work is white and the iron caisson is painted brown. This light is very similar to the Sandy Point Shoal light that can be seen from Sandy Point State Park or from the Bay Bridge. 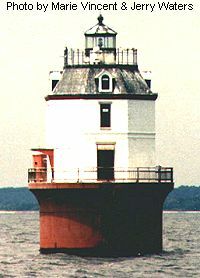 This light was fully automated in 1938 and the last Coast Guard personnel were removed in 1962. It is reported that the interior of this light is in very poor condition and in need of a lot of work.